It is with great excitement and hesitancy that I'm doing my first giveaway. From a child, I've been blessed by the daily devotionals in Our Daily Bread. Discovery House has offered one reader a copy of Our Daily Bread 2012 Devotional Collection. This daily devotional with selected readings encourages the reader to spend time with God each day - praying, reading the Bible, and reflecting on how His Word applies to everyday life. It is small and elegant enough to be carried with you on a daily basis. Leave a comment telling me how you would use this (required); be sure the comment includes your email address. I will pick a winner using random.org on December 31, 2011, so please get your entries in before then. Winner will be notified and have 48 hours to respond to the e-mail or another winner will be chosen. I know the winner will absolutely enjoy this gift throughout the year. The winner of the giveaway is Tina Shoulders. Thanks to all who stopped by, it's much appreciated. Have a wonderful New Year when it comes. What a great idea! I will tweet this and hope it sends a few people your way! I love giveaways and I am in need of a devotional for the new year. It's my goal to really dedicate some time to prayer and study instead of doing it when I think of it. The Lord has really been blessing me and it's high time I truly give Him more of me. Awesome giveaway and I love what you have done with your blog. It looks very nice and I would love to enter your giveaway as well. If I won I gift this to my mother that has just started going back to church. I will read it with my children before they go to the park each morning. I just realized I am putting this out there on the day you select so I may be too late. If I am, to whoever won it, Enjoy! I love this! In 2012, I'm actually searching for a church home for my family, so this will fit in nicely with our plan to be more spiritually focused. Every year I try to choose atleast two devotionals that I simply have to have one for the morning and one for the evening. 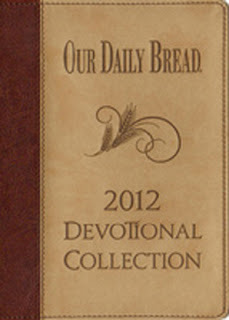 I would love to have this Daily Bread for 2012.
this would be my daily diet to feed my soul..
To improve the consistency of my devotional or give it to someone who is more in need of it than I am.